Voir les résultats lus par "Bob Hope"
This episode of Bob Hope's classic NBC radio show originally aired on April 8, 1947. This episode of Bob Hope's classic NBC radio show originally aired on October 26, 1948. This episode of Bob Hope's classic NBC radio show originally aired on February 17, 1948. This episode of Bob Hope's classic NBC radio show originally aired on May 13, 1947. This episode of Bob Hope's classic NBC radio show, broadcast from his hometown of Cleveland, originally aired on March 19, 1946. This episode of Bob Hope's classic NBC radio show originally aired on November 9, 1948. This episode of Bob Hope's classic NBC radio show originally aired on December 21, 1948. This episode of Bob Hope's classic NBC radio show originally aired on April 13, 1948. This episode of Bob Hope's classic NBC radio show originally aired on March 29, 1949. This collection features five episodes of the classic NBC radio show starring Bob Hope: Ava Gardner & Chuck Yeager, The Road to New Orleans, George Raft, Tyrone Power, and Gracie Allen. 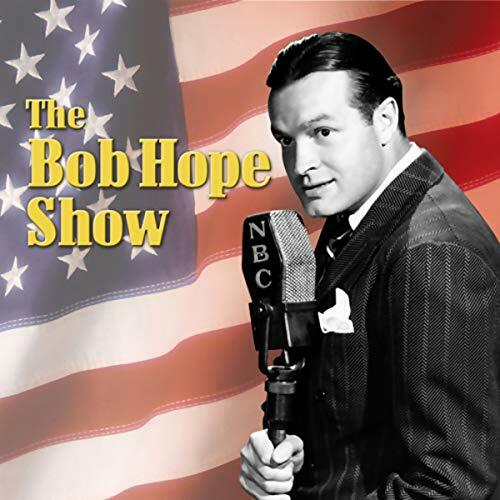 This collection features five episodes of the classic NBC radio show starring Bob Hope. Guest stars include Olivia de Havilland, Martha Raye, Chico Marx, and Blondie & Dagwood. This episode of Bob Hope's classic NBC radio show originally aired on January 21, 1953. This collection features six episodes of the classic NBC radio show starring Bob Hope: Claudette Colbert, William Holden, Roy Rogers & Dale Evans, Zsa Zsa Gabor, James Stewart, and Jack Webb. This episode of Bob Hope's classic NBC radio show originally aired on May 3, 1949. This episode of Bob Hope's classic NBC radio show originally aired on February 19, 1952. This episode of Bob Hope's classic NBC radio show originally aired on January 30, 1951. This collection features five episodes of the classic NBC radio show starring Bob Hope: Bing Crosby, Gregory, Dean Martin, Jerry Lewis, and Lucille Ball. This collection features five episodes of the classic NBC radio show starring Bob Hope: Bing Crosby, Eddie Cantor, Al Jolson, Van Johnson, and Peter Lorre.